2018 (1439H) Jun 15 Fri, Sg Merab 4-beranak. SB was in OSNABRUCK, Germany, in the middle of his fifth semester exam for a degree. And Muzani et al in Penang. All other ank2 were around, including Alya et al. Aug 22 Wed, 5-beranak in W-Tengah. The morning, after solat in Masjid Batu Rakit was filled with QURBAN activities in Banggol Setiu. Other ank2 were on their own, but all were reportedly around Bangi, including Alya et al. 2017 (1438H) Jun 25 Sun, Sg Merab and K Nerus, TRG. SB was in OSNABRUCK, Germany, in the middle of his Second Year final exam for a degree. NA third EID in the family. And the 8-th without Azizah. And DRVTGG 4-beranak on Sun night 1 Shawal for the rest of the break. ALYA was on her own now. Sep 1 Fri. Tok Jembal, K Nerus, TRG. 5-beranak with NA, CB and ASRI, and SB who was on a month leave from OSNABRUCK UNIVERSITY OF APPLIED SCIENCES, Germany, plus MALINI et al, and ALYA-FARHAN. Ruby, Zidni, and Muzani et al were on their own schedules. 2016 (1437H) Jul 6 Wed, Sg Merab and K Terengganu. SB was in OSNABRUCK, Germany, in the middle of his First Year final exam for a degree. NA first EID in the family. And the 7-th without Azizah. (A bomb-lie outside Masjid Nabawi in the evening of 29 Ramadan). And DRVTGG ber-5 on Thu 2 Shawal for the rest of the break. Sep 12 Mon. 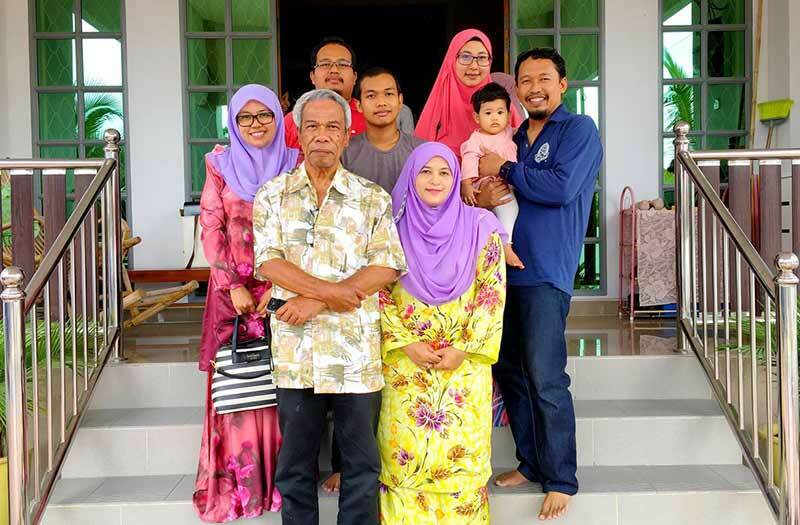 Tok Jembal, K Terengganu. With ALYA and CB and ASRI. SB was in OSNABRUCK UNIVERSITY OF APPLIED SCIENCES, Germany in his second year, for a degree. ZIDNI et al were in as well. Solat in Bintang otw to P-Panjang, JERTEH for NA's Qurban, where ank2 spent the second half of the day before returning to Tok Jembal, to CB-ALYA back to KUL by land. 2015 (1436H) Jul 17 Fri, Sg Merab. SB was in BERLIN, Germany, since Mar 28, in his German course, en route to OSNABRUCK for a degree. Sep 24 Thu. Sg Merab and K Terengganu. ALYA was on her last leg of her MSc experimental in UPM. 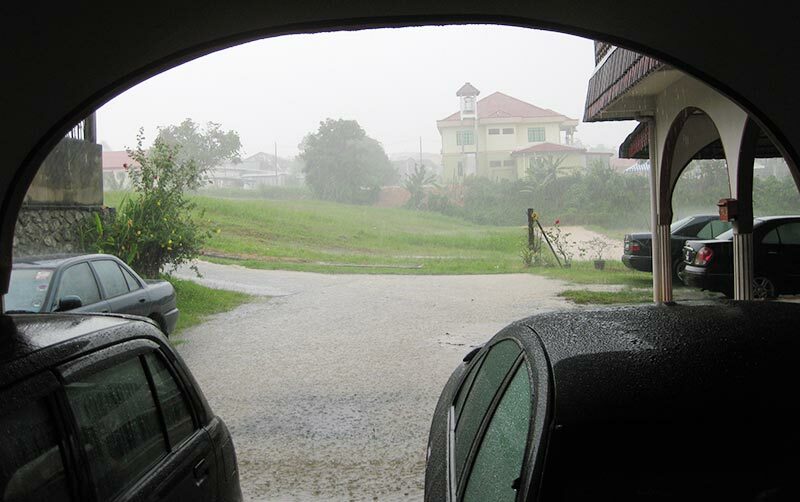 CB was in his third week of LI in BBBangi in his final semester in Unisza. SB was in OSNABRUCK UNIVERSITY OF APPLIED SCIENCES, Germany since Sep 1, for a degree. Asri was two weeks away from his PT3. NA was two days away from being solemnised into the family. Every ank-cu2 was in KTrg, except Intan, and SB bracing for the solemn event of Sep 26 Sat. NB 1 Z-Hijjah, a storm was sent to Makkah, followed by heavy rain, a crane fell on the Saer Path, shahid-ed more than a hundred, a few M-Sians. And finally a stampede during Haj which caused more than a thousands lives. It was a tragedy year in Makkah. 2014 (1435H) Jul 28 Mon, Sg Merab. Oct 5 Sun, Sg Merab. SB was just finishing his A-Level trial examination in INTEC Shah Alam. 2013 (1434H) Aug 8 Thu, Sg Merab. Oct 15 Tue, Sg Merab. 2012 (1433H) Aug 19 Sun, Sg Merab. 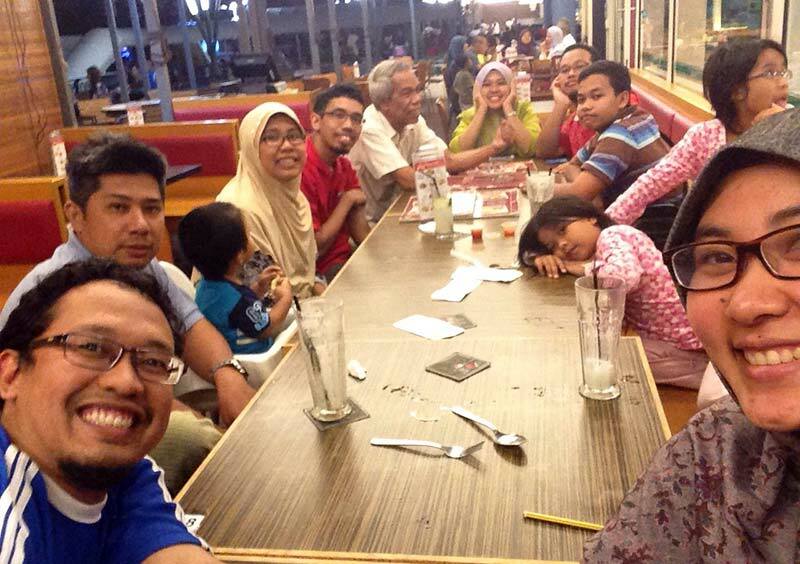 CB was two weeks away from checking-in in UniSZA for his next phase. Asri was three weeks away from his UPSR. Oct 26 Fri, Sg Merab. SB was ten days away from his SPM, and was not allowed to go home. We spent the raya with him instead in the school, ASIS, my physical alma mater. 2011 (1432H) Aug 30 Tue, in Sg Merab with the four lower kids. The four upper kids et al, were away on their own, in their own. The break schedule had made it possible to be in TGG, if Azizah were still around. Nov 6 Sun, in Sg Merab with every one, big and small, and extended to all staying around. A gathering in the evening, every one could tell that every one missed the only one missing. 2010 (1431H) Sep 10 Fri, K Terengganu. FIRST Shawal WITHOUT Azizah. All eighteen in the family were in Trg on the first Shawal. SB closing to PMR. Nov 17 Wed, Sg Merab. FIRST Zulhijjah WITHOUT Azizah. Someone is performing Haj for Azizah in Makkah-tul-Mukarramah, supposedly hand-picked by Awi MakTehPah. 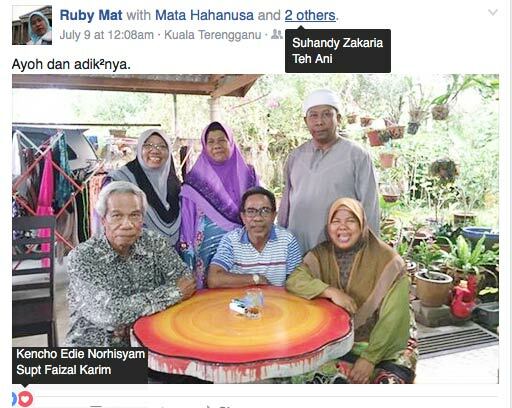 Malini et al in Meru, Klang; Intan in Putrajaya Hospital on duty; Edi at his house BBB 3/64. The rest were in Sg Merab on the Eid morning. Alya was in the middle of her semester exam in UPM. 2007 (1428H) Oct 13 Sat (1428H), Kuala Terengganu Dec 20 Thu (1428H), Sg Merab. Alyani closing to SPM Dec 31 Sun (1427H), Sg Merab. 1999 (1419H) Jan 19 Tue, Kuala Terengganu Mar 29 Sun, Buluh Kasap, Segamat, Johor. 1994 (1414H) Mar 14 Mon, Kuala Terengganu May 21 Sat, Sg Merab. The founding APCCS, May 24-27. 1987 (1407H) May 29 Fri, Kuala Terengganu Aug 4 Tue, Kuala Terengganu. 1985 (1405H) Jun 20 Thu, B B Bangi. The break was too short. 1977 (1397H) Sep 15 Thu, Kuala Terengganu. First Shawal WITH Azizah Nov 20 Sun, Damansara Utama SS22 (Mewah), PJ. 1976 (1396H) Sep 24 Fri, Salford, Ellesmere Ave, Mcr, England Dec 1 Wed, Damansara Utama SS22 (Mewah), PJ. First Zulhijjah WITH Azizah.